When Boon offered to send us one of their best-selling Flair chairs to try out and review (and give one away too! ), I was really excited. I'd heard great things about not only Boon, but this chair in particular, and I was really looking forward to having one of our own. The chair arrived in a large box and the simple directions made assembly a breeze. Hank put it together very easily and within ten minutes it was ready for use. 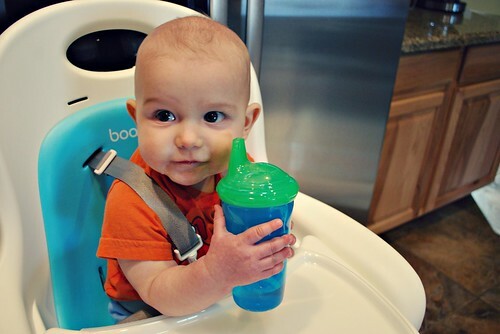 We chose the white (coconut) seat with the blue pad, and I wasn't exactly sure about having a white highchair but those hesitations were completely silly because this is THE easiest thing to clean in our home. We know you have a Flair for good taste. No cracks. No crevices. Therefore, no abyss full of crumbs. This one-piece seat is the sleekest, smoothest thing going and it makes cleanup unbelievably easy. Its dishwasher-safe tray cover actually fits in a dishwasher. And the continuous height positioning with pneumatic lift is just a fancy way of saying you can pick the exact height you want to fit your table. Yes, yes and yes! And the whole no abyss full of crumbs thing? So true. Henry isn't into crunchy, crumbly food yet, but the worst offender in terms of messiness would have to be peas, and this chair makes clean up a lot easier than it would normally be. Simply use a damp cloth and wipe it up. And we love that you can just pop the tray in the dishwasher. And on a clean up note, if you happen to destroy the colored pad, you can always order more of those, or even another color to change it up. the pneumatic lift - I love that H. can at all different levels - our counter, table, etc. What I don't like - NOTHING. Seriously. And I'm not just saying this because they gave us one. I honestly love it. 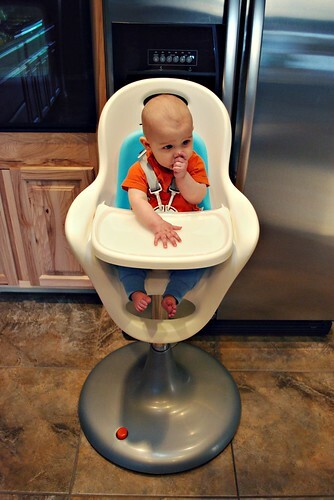 If you're in market for a high chair and don't mind spending a little bit of money, I highly recommend the Boon Flair. And if you have one, let me know what you think! 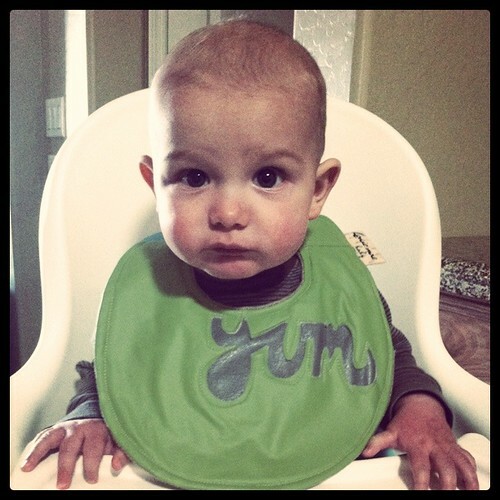 I love this highchair. I just used it for the first time this weekend at a friends house. I love how small it is and it's easy to use. Not bulky. Love. We love our boon and so does our baby girl! We put her in it just to play sometimes. When registering about a year ago we knew we had to have the Boon Flair. With it's pneumatic lift, wheels, and super easy clean up it is kid of a no brainer. I also just love the look of it. I would recommend to any mama-to-be. While I do not have a child of my own I did live with and occasionally babysit for a one year old and we had this high chair. Now, I am pretty much a novice when it comes to really watching children but I think a lot of parents are and this high chair was awesome. Easy to move when needed, stopped and locked down when you were on slippery ground (kitchen floor). 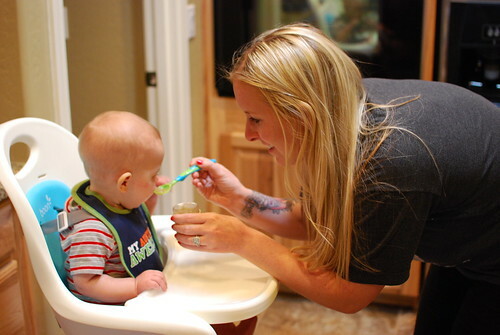 The way everything is easy to wipe down and clean was really helpful, not just to me on the one day a week I watched the cute little thing, but I could tell his Mom really liked it too. What an amazing chair! I love the fact its on wheels with a foot stop lock (guessing that is what the red button is for) and that it cahnges height. It is amazing! You're right. It doesn't get easier. We picked the white with orange pad several months ago. I think this definitely one necessary purchase that is worth every penny. Come to think of it, I haven't found anything bad that Boon makes. Ordered mine today but the blue raspberry seat pad is impossible to find right now. Boo. Lucky girl!